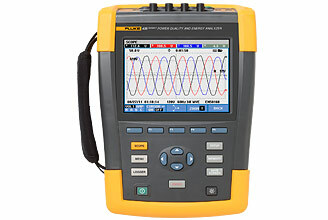 Think of the Fluke 435 series II Power Quality and Energy Analyser as your insurance policy. No matter what goes wrong in your facility, with the 435 you will always be prepared. Equipped with advanced power quality functions and energy monetization capabilities, there is no electrical issue this model can’t handle. and introduce, for the first time ever, the ability to quantify the cost of energy losses. and unbalance issues, allowing the user to pinpoint the origin of energy waste within a system. Simultaneously measure AC O/P power and DC I/P power in power electronics, to determine Power inverter efficiency. Capture fast RMS data, show half-cycle and waveforms to characterize system dynamics (generator start-ups, UPS etc.). Classic active and reactive power measurements, unbalance and harmonic power, to pinpoint the fiscal costs of energy loss. Troubleshoot real-time and analyse the trends using cursors and zoom tools. Measure all three phases and neutral with enhanced thin flexible current probes to fit into the tightest places. Monitor ten power quality parameters on one screen as defined in EN50160 power quality standard. Configure data logger for any test condition with memory for up to 600 parameters at user set intervals. View graphs and generate reports using the analysis software included. Seven hours operating time per charge on the Li-ion battery pack.